The RAF was founded on 1st April 1918, during the First World War, by the amalgamation of the Royal Flying Corps and the Royal Naval Air Service. 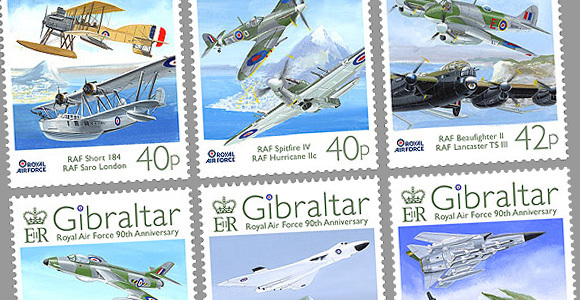 The RAF is the world’s oldest air force of any significant size to become independent of army or naval control. The RAF underwent rapid expansion prior to and during the Second World War. During the Battle of Britain in 1940, the RAF’s defence of the skies over Britain prompted Churchill to say “Never in the field of human conflict was so much owed by so many to so few”. In recent times several large scale operations have been undertaken by the RAF in the 1999 Kosovo War, the 2001 invasion of Afghanistan and the 2003 invasion of Iraq. The miniature sheet (left) commemorates World War I and in particular No. 265 Squadron, an anti-submarine squadron of the Royal Air Force. The squadron was formed in August 1918 at Gibraltar to perform antisubmarine patrols.